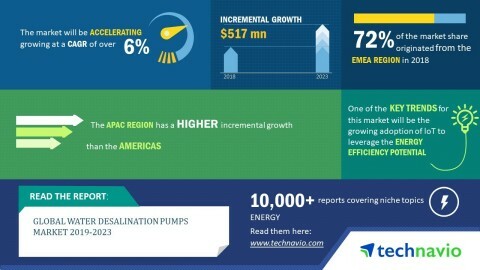 The global water desalination pumps market is expected to post a CAGR of over 6% during the period 2019-2023, according to the latest market research report by Technavio. A key factor driving the growth of the market is the increasing need for energy-efficient pumps. Desalination is an essential part of the water and wastewater industry. As per the IEA published World Energy Outlook 2016, the electricity consumption in the water and wastewater industry was approximately 4%, and thermal energy equivalent to 50 million tons of oil was used in desalination plants. As per Technavio, the growing adoption of IoT to leverage the energy efficiency potential will have a positive impact on the market and contribute to its growth significantly over the forecast period. This global water desalination pumps market 2019-2023 research report also analyzes other important trends and market drivers that will affect market growth over 2019-2023. The Internet of Things (IoT) is becoming the future technology for utility companies and electricity aggregators to distribute power between grids and consumers. Currently, IoT has found its way into grid automation to revolutionize modernized communication. In industrial premises, the advantages of IoT have been increasing the adoption rate of smart devices. In order to control plant operation over the Internet, desalination operators are extensively implementing automation. Electricity aggregators are also preparing to deploy two-way communication devices in demand response programs. These devices can use Wi-Fi or cellular networks to combine with smart data analytics and engineering. Furthermore, they can provide valuable insights to industrial operators regarding the overall electricity consumption pattern. “The implementation of IoT helps industrial operators to monitor and manage production equipment and optimize the energy consumption on a real-time basis. They also aid in demand response, thereby reducing the energy consumption and saving on energy costs. Though there are energy service companies that provide energy efficiency services, factors such the long payback period and high capital cost make it difficult for the industrial operators,” says a senior analyst at Technavio for research on water and waste management. This market research report segments the global water desalination pumps market by application (RO, MED, and MSF), product (centrifugal and PD), and geographical regions (APAC, EMEA, and the Americas). The RO segment held the largest market share in 2018, accounting for nearly 63% of the market. This application segment is expected to dominate the global market throughout the forecast period. EMEA led the market in 2018 with a market share of over 72%. This region is expected to dominate the market through 2023, however there will be a decrease in its market share.